‘Haven’, Lindsay J. Pryor’s first standalone Lowtown novel is a worthwhile read. The best way I can sum it up is to say it is a mix of ‘Insurgent’ meets ‘Discovery of Witches’. This is best described as an urban fantasy novel with a bit of paranormal and romantic elements thrown into the mix - and the end result is interesting. ‘But she had no initiated powers anyway. She wouldn’t know what to do with them even if she did have. She didn’t even know what kind of witch she was’. The author takes you to another world she has created (I have read no other Pryor books and this was never an issue) and most certainly she drops you slap bang right into the middle of all the action. The writing is engaging as you feel for the residents of Lowtown, their fear and desperation are palpable. At a deeper level, ‘Haven’ is about the dark and cruel side of humanity, rather than the focus being purely on the paranormal and the likes of witches or vampires etc. I liked that - corruption and control is at the heart of this novel. 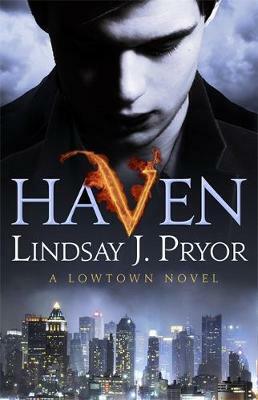 The plot,the characters and the engaging writing make ‘Haven’ a worthwhile read. The new angle concerning the political and whole social injustice theme was interesting. Forgotten races, extortion and crime and the golden ticket chance to escape it. Yet amongst all this permeates integrity and hope, loyalty and love - a good balance of evil versus good. You will find yourself drawn into this world of ‘us’ versus ‘them’ - a simple oft repeated theme but one that is well executed.